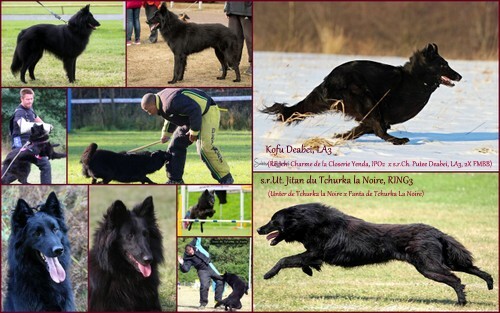 Kofu Deabei, A3 is more than half sister our A3Ch. Ykuk Deabei (FMBB Teams World Champion, Vice World Champion FMBB 2017, Czech Champion FCI + 3x BB...). Kofu has great jumps, power and energy, food and toy drive, no shooting reaction...after her accident with the car she stoped agility unfo rtunatly. We decided for one litter by her only and we decided for working line male Jitan, healthy, outbreed with her to 6 generation, with great sport results, very balanced and clear head, power...and still nice looking. We expect groenendaels (+tervuerens) for sport - agility, obedience, IGP for fun...for serious and fine candidates only.